For over 45 years, Sunbrella has been the leader in performance fabrics. No other resource is more committed to leading the performance fabric industry with innovations that fit today's busy lifestyles. With impeccable quality, sophisticated styling and best-in-class warranties, the new generation of Sunbrella offers more possibilities than ever. 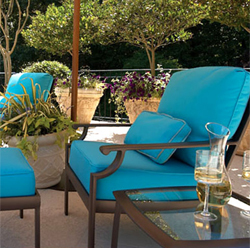 Sunbrella fabrics are now available for all of your decorating needs – outdoors and in. From earning the Skin Cancer Foundation's Seal of Recommendation for its ability to filter out the sun's harmful rays* to receiving Green Guard Children and Schools certification for its contribution to healthy indoor air quality as a very low emitting interior product, Sunbrella continues to receive accolades from designers and architects to boat owners and homeowners. As a vertically integrated manufacturer, Glen Raven is in an ideal position to control and enhance every step of the Sunbrella production process. We begin with proprietary polymer chemistry and apply technical precision at every step of the production process – fiber formation, yarn manufacturing, weaving and finishing. We deliver a product no one thought possible a mere 45 years ago – and that's just the beginning.